Pour pasta (from Suddenly Salad box) into 3-quart saucepan 2/3 full of boiling water. Gently boil uncovered 12 minutes, stirring occasionally. Drain pasta. Rinse with cold water; drain well. In medium bowl, stir together seasoning (from Suddenly Salad box) and blue cheese dressing. Add cooked pasta, onion and black beans until well blended. Cover; refrigerate 1 hour. Meanwhile, heat gas or charcoal grill. Rub steak on both sides with garlic pepper. Place steak on grill over medium-high heat. Cover grill; cook steak about 6 minutes on each side or until meat thermometer inserted in center of steak reads 140°F. To serve, place pasta salad on large serving platter. 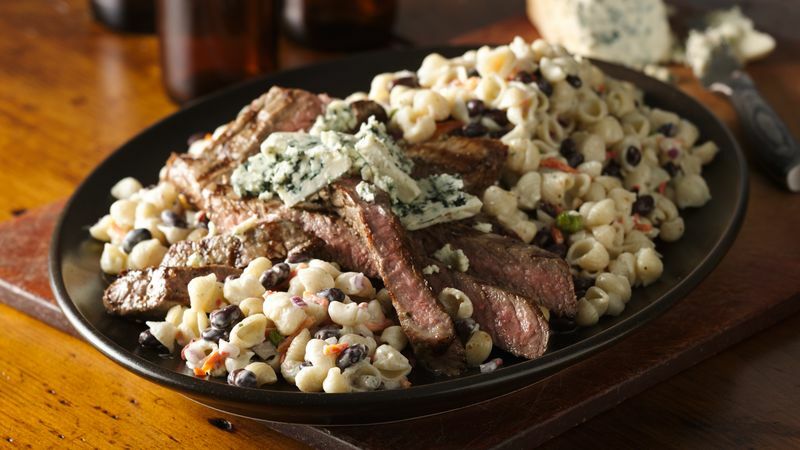 Cut steak into thin slices; arrange over pasta salad. Sprinkle with blue cheese crumbles. Garnish with French-fried onions. A great salad to pack along for a picnic or pre-game party. Serve with your favorite brew.